"The doll looks evil," I said to Natalie. She scowled. "No she doesn't." "I'd keep an eye on her at night." "Mommy." Natalie rolled her eyes at me. Let me back up. 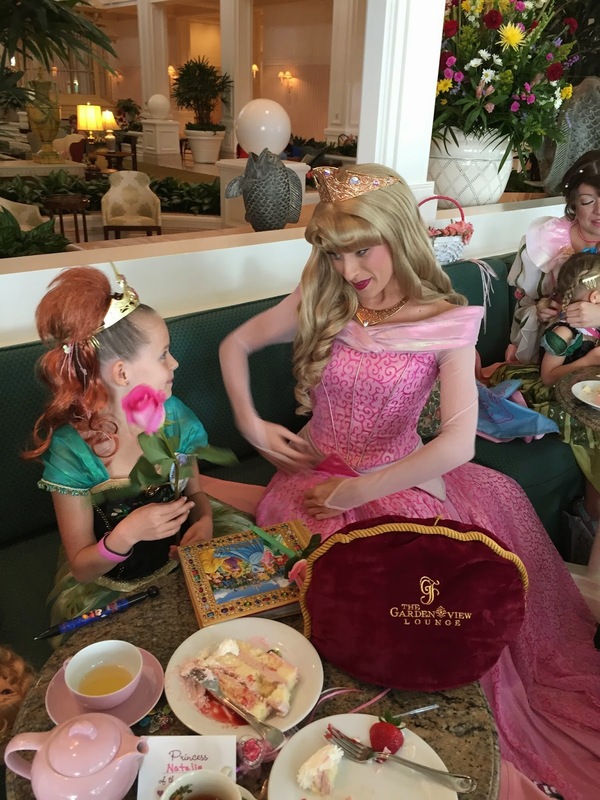 We were at the Perfectly Princess Tea Party at the Grand Floridian. 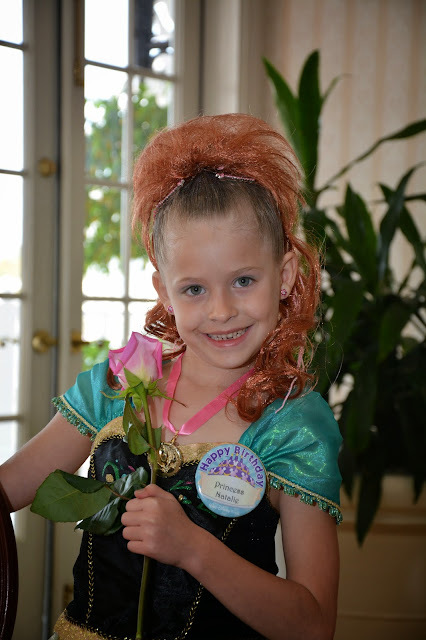 It was Natalie's birthday, and Natalie had discovered the wonder of the Grand Floridian. "Why aren't we staying here?" she asked me when we arrived. "Um. Because your daddy isn't Jay-Z," I answered. "I love it," Natalie gasped. "Are these the steps where DJ saw Steve in the Disney World Full House episode?" "I think so. Maybe. I know they stayed here." "I love it," Natalie repeated. The resort was gorgeous. I wish we could afford to stay there. Maybe one day. Maybe we'll strike it rich. I mean, they had TINY furniture for the kids. But for now, we could at least attend the Perfectly Princess Tea Party. We checked in, and a woman came out a few minutes later. Natalie turns around and says loudly to me, "Who is THIS?" That was a tad embarrassing. Most kids are ooohing and ahhing over her pink dress. Natalie wants to know who the heck she is. Her name is Rose Petal, by the way. Rose Petal is a friend of Aurora's. Rose Petal calls each child up to invite them to her tea party. Rose petals are dropped over them. Hopefully no one is allergic. I thought this name tag at our table was adorable. Natalie of the BUTTERCUPS. Adorable. I'm going to randomly call her that now. "Hey Natalie of the Buttercups? Dinner!" The creepy--I mean, the precious doll is waiting at the table for the kids, and Natalie immediately scooped hers up. There's also a crown and a wand. Inside the teacup is a charm bracelet. You aren't supposed to remove the cloth napkin over the teacup until Rose Petal says to, but Natalie immediately lifted hers up and was like, "A bracelet!" I quickly shoved the napkin back over the bracelet lest we get lectured by Rose Petal. She eventually said we could lift our napkins, and Natalie pretended to be amazed to find a bracelet. Then tea is poured for the children. It's really apple juice. Natalie took a sip and went, "I'm telling you this secret: this isn't tea. It's apple juice." Adults get hot tea though. Rose Petal sings throughout all of this. She sings popular Disney songs. She also tells the story of how she came to be and how she knows Aurora. She also asks if anyone is celebrating a birthday and everyone sings the birthday song. Natalie was pleased, because it WAS her birthday. Natalie whispered to me, "Your cheese is rotten, I think." I had never seen cheese like that, but it was good. I'm not refined, you see. My cheese is usually square and orange. So Rose Petal still sings throughout all of this. Sometimes she'll come over and sit at your table while singing. This can be awkward if you have a mouth full of green cheese. She teaches everyone Aurora's song. You know, the one they sing to her at the beginning of Sleeping Beauty? "Health to the princess, wealth to the princess, long live the Princess Aurora." And then, suddenly Aurora comes out! She visits every table. And while she does this, CAKE is brought out. Sometimes I wonder if Natalie is really mine, because she did not like her cake. So I ate part of hers. Aurora came over with a rose. It's a personal experience, because she really takes the time to talk to the kid. It's not rushed like other meet and greets. Rose Petal also stops by to talk to the kids. She also gives them a necklace. It doesn't take much to impress Natalie. She gasped, "I LOVE that!" As Rose Petal and Aurora finished greeting everyone, Natalie danced. There's a man playing the piano constantly throughout the tea, and Natalie loves music so she thought, "Why not?" Soon after, it was time for the parade. The kids are led throughout the Grand Floridian. The guests of the resort were amazed. I kept hearing, "How adorable!" and "What's going on here?" They're even led up Natalie's beloved stairs. Then they take a photo with their terrifying--I mean, precious doll. There is a PhotoPass photographer to do this and yes, you can take your own photo too. They aren't done after the photos. No, afterwards the kids get to go into the store next door and name their doll. A person writes out a birth certificate for the doll. As we waited in line, Natalie was like, "Isn't it Aurora?" I said, "I suppose you can change her name if you'd like." Natalie went with Giselle, but she whispered, "I'll still call her Aurora, because that's who it IS." Do I think the tea is worth the cost? Yes. It was pretty cute, and I feel the kids get a lot. This is everything Natalie received from the tea, minus the demon doll. But he knew it was Natalie's birthday and I promised it would be a ONE TIME thing, so he agreed. And even though the doll haunts my dreams, my daughter absolutely loved her tea experience. So I do suggest doing this at least once if your kid enjoys tea parties. I'm not sure if there is an age limit, because there was a fourteen-year-old dressed up like Jasmine. Most of the girls are dressed like a princess, but some are just in regular dresses. So yes, I do recommend this. That looks like fun. Although I thought Rose Petal looked scarier than the doll. Eek. That's pretty rude. 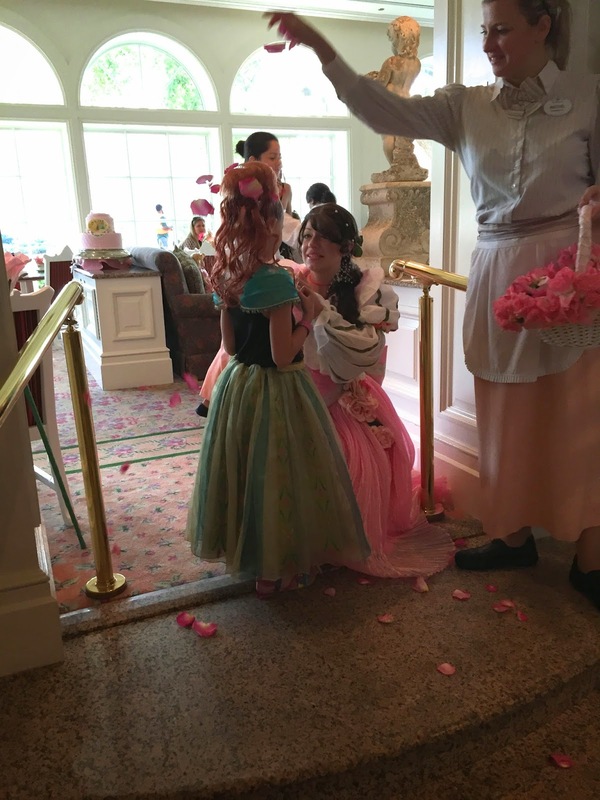 I've been to the tea party and Rose is really kind and sweet to the children. You're an internet troll and should be ashamed of yourself. the last time i was at GF i saw this and secretly wanted to do it! I once saw the kids gathering up for this experience and thought it looked like fun. we did a tea party on our cruise but it was nowhere near as fancy as this! I also did brunch at the grand floridian so I could enjoy the hotel without staying there! That is so cute and what a great way to celebrate her birthday! 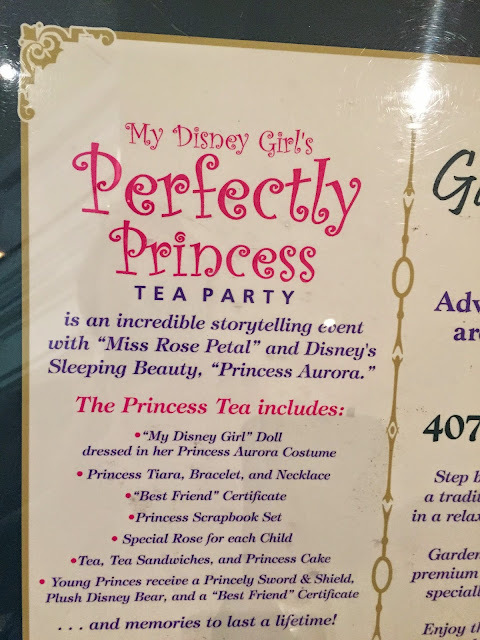 I think that is definitely a great event for girls who like Princesses!!! So glad that Natalie could celebrate her birthday that way - I'm sure she will remember it for many years!!! Hahaha! My kid probably would have asked who she was too. I think it looks like a great time, but the price would probably make me say the same thing as Tom, lol! Omg I love this. This is absolutely adorable. I would have fun at something like that, lol. Soooooooooooooooo cute!!! and love your commentary. The doll IS creepy! LOL! Your kid is so amazing because she references Full House. I also love that she danced. May you never change, Natalie. She looks adorable!!!!! I love it! Because your daddy isn't Jay-z! You are hilarious! haha She is so cute! Sigh, I love the Grand Floridian. Someday I will stay there! What a fun experience - your daughter looked adorable. What a great experience! Our daughter isn't even 2 yet and I've already brought up having a princess themed party when shes about 6 or 7. There is a place in town that hosts them for an absurd amount of money. All the princesses are there though! At least I have a few years to convince my husband its worth it lol. What a wonderful birthday for Natalie. I think you made the right choice. It may have cost some money, but she'll have that memory forever. And that is everything. (I chuckled about the cheese. I covet amazing cheese plates. I admit it, total cheese snob). Is it bad that I want to do this at 26 as a fully grown adult with no kids? The GF is my favorite resort! What an amazing time and wonderful way to celebrate! I agree the Aurora doll is a bit creepy, and I loled about the cheese and the Jay Z comment! What a fantastic day. My daughter would love this experience. Hek I want the experience too. Someone drop some petals on my head and declare me princess for a few hours. That's too funny... you said the dolls look evil, haha! I always loved dressing up as a Princess when I was little. Nice to see mothers such as yourself allowing their daughters dreams to come true! Wow looks like a fantastic day! Dreams do come true! Looks like your princess had a really wonderful time! Oh, I admire you for making time for your child to go on these kinds of party. Wow this amazing. She looks like she had an amazing time! Your daughter is beautiful! Hilarious - love your tone in your writing style. I am heading to Disney this weekend and was telling my mom she should do the tea - but insisted it would cost too much and be just for kids. Super cute, she is so adorable. Great post. Love this tea party! I want to do it with my daughter, we are both big Disney fans! Happy Birthday! Seems like she had a great time and I bet she will remember this for years. She looks adorable. Love her princess dress. I agree,the doll is kind of creepy. The food looks amazing! Aurora is my favorite Disney princess so I would probably have as much fun as the kids! Oh my goodness, how sweet! We stayed here years ago. Such a wonderful hotel! This is so cute! What a perfect afternoon for a little girl! Sounds like she had an amazing time! My daughter is totally into princesses right now. She would totally love for me to take he to this event! My Daughter would love the Perfectly Princess Tea Party at the Grand Floridian. She is all about the Disney princesses. I would be in love with this if I was a child, (hey probably even now lol) I love anything Disney related, your little one looked like shes having an absolute ball! You were able to photograph a lot of key moments. Natalie was SO into this. I love how she asks questions instead of just going with the flow on everything. That's a great Quality to have. Hahhahahaha! I laughed so hard ...."are you on crack". Yeah, my partner would react the very same way when it comes to spending money on such things. She looks like she had so much fun though so it's worth it. She'll have those happy memories forever, can't put a price-tag on that. HA! I totally laughed while reading this whole thing... your daughter is a hoot. I'm so happy she had a great time. This is something she'll remember forever. I am so happy your daughter has a good time! This looks like such a good experience and if I had a daughter I would love to take them. I love afternoon tea in general so this was a great read! She deserves a princess tea party, and also every little girl. They need to experience this precious moments, its like a right of passage. It will be a good memories when they grow and pass it on their kids. What a lucky little girl to have a princess party. The memories will linger for years to come. I love the creepy doll reference. LOL! I guess as long as she likes it. I can only imagine what the cost was, but I am sure it was worth every penny. They really went all out and I am sure the girls were ravving about this for days. Way to go mom! What a wonderful tea-party experience! I'm sure Natalie would have loved the entire experience. 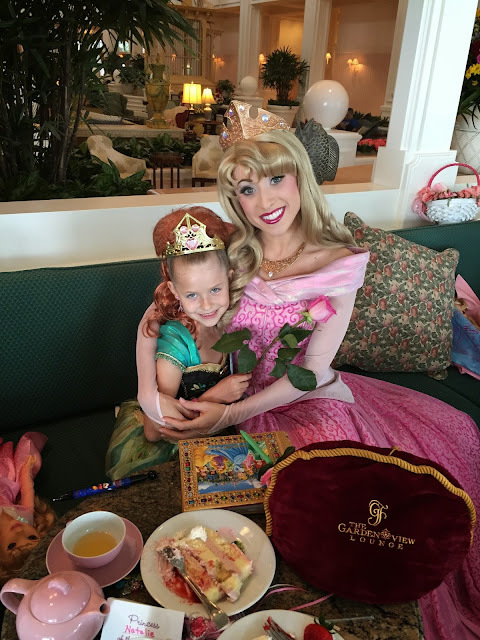 Hats off to you for taking her to this perfect tea party and making her feel so special! She truly deserve this! Aww when I was little I always wanted Princess Parties too! To be honest, everything was about Disney and Princesses when I was little... I was very girly! Tea Parties are still fun now. Your daughter looks so happy and cheerful with her experience.She will never forget this day even when she grows up!! This is such a great experience! I love the princess dresses and awesome that she got to meet some of the Princesses. OMG the Full House episode!!! I can't believe I remember the exact scene you're talking about, but I do! 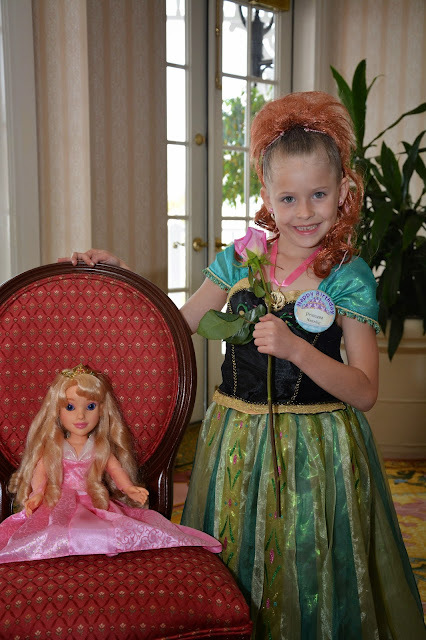 Every little girl would love a Disney tea party day. Wonderful you could make a dream come true for your daughter. This is one thing I will do for a granddaughter one day. How special and lovely! This is on my Disney Bucket List! It looks like so much fun! I am a sucker for anything Disney! 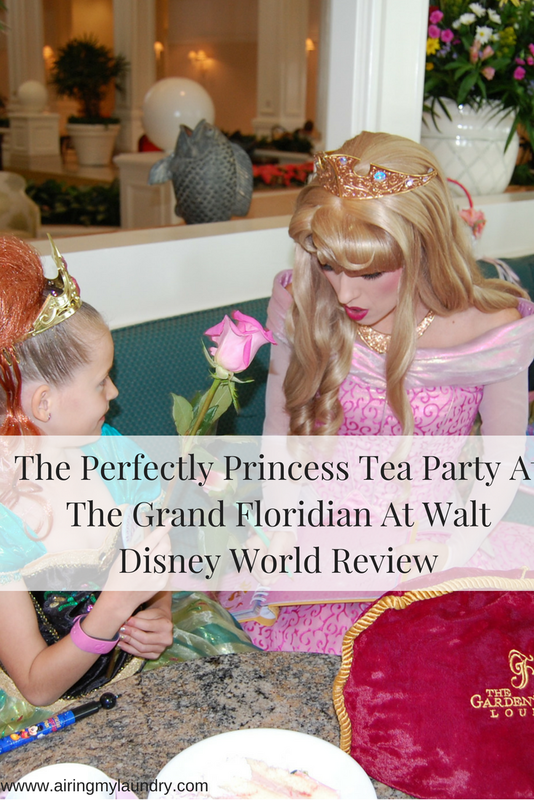 We live about an hour and a half away from Orlando, so we try to go often but haven't done the Grand Floridian Tea Party yet. This looks like an amazing experience. I have to see if I can get one of my nieces to attend with me. I know they would love it. The Grand Floridian is one of my favorite Disney spots. 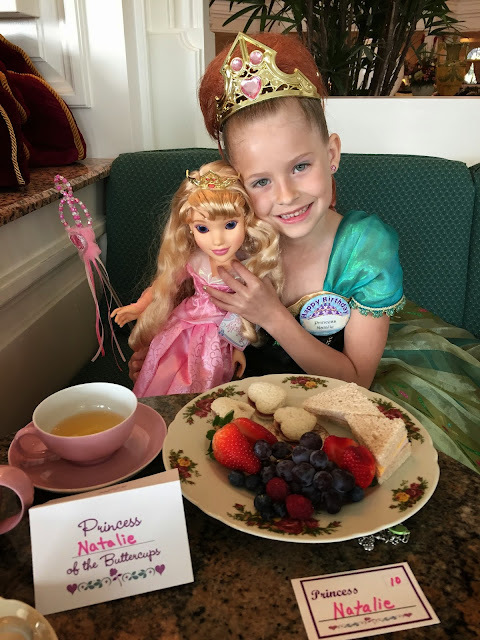 Who am I kidding every spot at Disney is one of my favorite Disney spots but the Princess Tea Party makes me wish we'd taken our daughter when she was much younger. I know she would have enjoyed it so. Looks like Natalie really had a wonderful time. Maybe I'll have granddaugthers and be able to take them. Your daughter reminds me of my daughter when she was younger and loved to dress up like a princess. This tea party and hotel look like a dream come true for a kid. The Grand Floridian is my Mom's favorite, I stayed there with my parents many years ago. It is beautiful but yes it is expensive. Your daughter looks like she had fun. Aww, what a perfect experience to meet all those princesses! I would even love to do this in my 30's - and can't wait to have kids to go to Disney again! I love the Full House reference. I just watched that episode the other day. This event looks so beautiful and precious. Your daughter looks like she had a ball! I love how much they do for all the girls. My daughter is one and I would love to do this with her when she is old enough! Wow! This looks like a little girl's dream come true! I wish I had a girl so I could take them to this! I know I would've loved this as a little girl! What fun! I would love to stay at the Grand Floridian as well. I didn't realize that's where they stayed when they filmed the Full House episode! Now this looks like every little girl's dream come true! I would have loved to do this as a kid!! So cool to be dressing up in character especially like a princess! Natalie looked so beautiful on her birthday. The tea experience seemed really fun. Such a great experience for Natalie. This is the part my daughter missed on when we went. My girls love to dress up like princesses and have tea parties. They would really LOVE to visit this place! What a lovely experience for a little girl! I think this is really worth it especially since it's her birthday. What a treat! I also love the things that she got after the whole program. What a beautiful experience. I wish my girls were smaller and wanted to participate. I would love to take my granddaughter to this. She lived in her Frozen princess dress until she out grew it. What a great experience this would be. What a great experience for a lovely daughter like her. It was a wonderful blessing she ever had. What a little girls dream! I love afternoon tea and this is so cute! My granddaughters would have an absolute blast. We have tea parties here a lot and go to the tea room for tea parties, but nothing would compare to this. What a pretty princess experience. Whenever I have a daughter I am going to live through here and take her to Disneyworld for the Princess Tea Party!